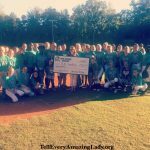 Claudia Poccia, best known for her work in the luxury cosmetics and skincare industry, published an article in honor of National Ovarian Cancer Awareness Month, urging the public to take action in the fight against ovarian cancer. Claudia actively gives back to the cancer community, helping women going through the struggles of cancer look, and feel, beautiful. 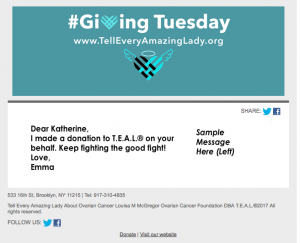 In the article, Claudia explains how she was affected by ovarian cancer when her sister was diagnosed and gives a shout out to T.E.A.L.® recognizing the work that we do. Claudia stopped by our T.E.A.L.® Community Center over the summer to meet with our CEO & Co-Founder, Pamela. Thank you Claudia for all that you do to help every lady feel amazing! Follow the link to read her article.